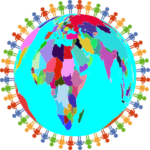 How do you use global and multicultural resources to enrich your children's education at home? How do you like to add multicultural topics or global issues into your curriculum? Share with us the hardest questions you've been asked from kids about the world. Feel free to share your response or even the whole discussion. We are so excited to be teaming up with Buncee and Skype in the Classroom to bring #SkypeBunceeBuddies Literacy Global Project this month! The theme is to SPREAD JOY, so if you and your classroom want to participate in this project and share how you spread joy, then please visit this link to sign up: https://education.microsoft.com/skypebunceeproject. We have some great videos on Flip Grid to learn more about us and how Joy Sun Bear loves sharing joy,! You can also create your own Buncees on this Buncee Board (https://app.edu.buncee.com/bunceeboard/3261c1ce7bdd41df8062efb5cee8171f) after signing up, and connect with other classrooms around the world through Skype in the Classroom to share how you spread joy! What would you like to see next on our site? Do your kids have questions for Joy? Post them here and Joy will reply back to them!